We go to extreme lengths to use only high grade brown antler. This assures that your piece will become an heirloom. Nature, itself, provides the antlers we use. Once a year, all members of the deer family which includes mule deer, moose, and elk, to name a few, shed their antlers. These are the antlers we use for our products. Each year people and organizations such as the Boy Scouts gather these antlers to sell. 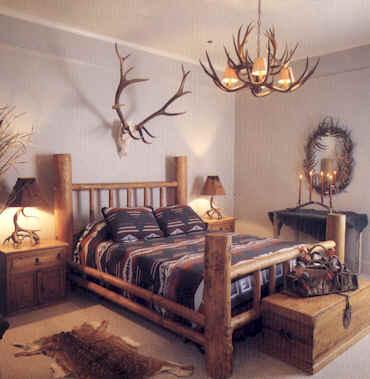 The top quality elk and mule deer antlers we use in large chandeliers come primarily from Northern New Mexico where we gather some and buy others from local residents in that area. Our whitetail antlers are gathered primarily from the Northwest and Canada. We use naturally shed antlers. We have an in-house interior decorator who is available to help you select the proper piece for your needs. We specialize in custom designed fixtures and furniture. All lighting products such as sconces, lamps, and, chandeliers are internally wired. Our chandeliers are balanced to perfection. We do our own packaging and crating so that your custom creation arrives in the condition you expect and deserve. All of our pieces are custom creations. Please call for pricing at 830-997-2263. Or if you wish, we can be contacted via email at antler@ktc.com. An illustrated catalog is available for a nominal fee of $5.00, which is refundable with any purchase.